You've seen all the posts before, haven't you? "Shoot in natural light. Employ the rule of thirds. Watch for leading lines." All very good advice; composition and lighting are important. But focusing on such macro topics can gloss over some minor subtleties, leaving the final results of novice travel photography lacking that certain je ne sais quoi. 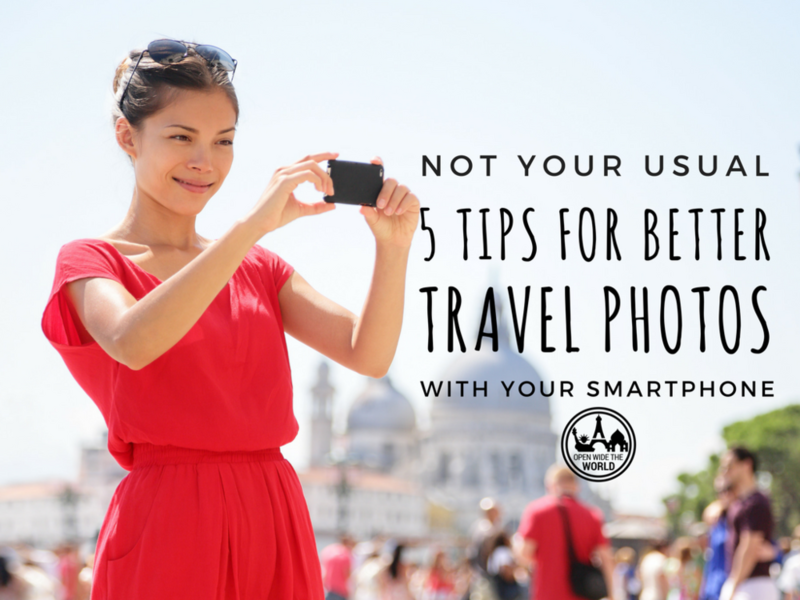 So we have compiled a list of the top five strategies we use to up our travel photo game. If you scroll through scores (or hundreds!) of travel and foodie-travel pics a day, you have probably noticed a setting you love to see others make use of (and conversely, a pet peeve of seeing that setting un-used). For me, that favorite is selective focus. Selective focus allows the photographer to focus in on one area of the frame, keeping the remainder of the photo blurred out. This technique is specifically helpful when the background might be distracting attention away from the main subject of the photo. When photographers use selective focus, it's as if they're says to the viewer, "I appreciate you, Viewer. To show my appreciation, I will filter out for you all of the background confusion that isn't part of the subject." How nice of photographers to think of us viewers! Of course, that means when photographers don't use selective focus, its like they're saying, "meh, I don't want to bother with my settings. You can just filter out with your eyes whatever you don't think is the subject here." Which photographer would your viewers like you to be? Yep, me too! It can be almost impossible to hold a camera parallel to the ground in one plane, and parallel to the façade of the subject in another plane, especially when trying to minimize disruption and get photos quickly. So, of course many travel photos will start off looking like the subject is going to slide right out of the frame, or like a building is falling over backwards. But just because a photo was taken that way does not mean it has to be posted that way. When strolling the neighborhoods of Rome, we didn't stop long to set up perfect shots; we edited later. Ever scrolled through Instagram and wanted to scratch your eyes out after seeing the same shot of the Taj Mahal? For the millionth time! Us, too! That's why we advocate for stretching beyond the familiar "stand where I am and shoot straight forward" M.O., and push ourselves to see things from new perspectives. Literally! Sure, to find three unique views of a subject, you may have to stand on a chair in a diner, or crouch down on your heels in the street. But you'll be rewarded with some unique visuals that your viewers haven't seen 100 times already. And they will thank you for it! 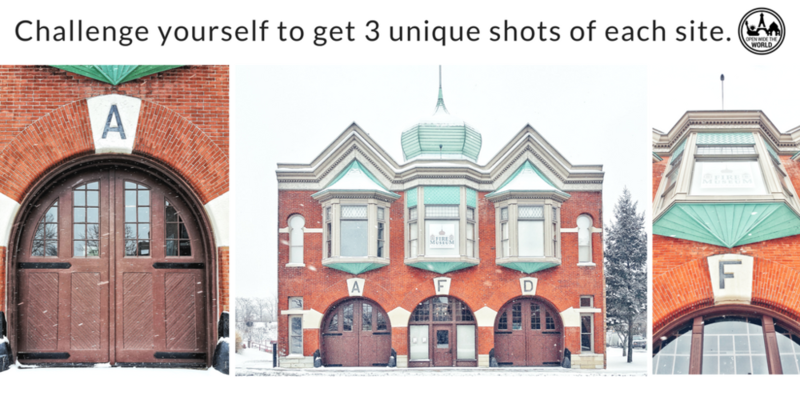 Even in adverse weather conditions (like snow and windchills of -5F), we take the time to photograph a site from several angles; often the full view, a close up on an interesting element, and looking up, as seen in this series of the Aurora Regional Fire Museum in Aurora, IL. While the above advice can garnish some unexpected and amazing captures, in some cases, there won't be time to shoot thrice. Especially with things on the move, like kids or animals. In the case of these fast-moving, shorter-than-us subjects, shoot from the subject's eye level. Rather than standing at adult height shooting downward, quickly squat to the level of the subject and shoot. This way, the child or animal won't be swallowed up by the background (which, at their height, would literally be the ground! ), as you see in the comparison below. 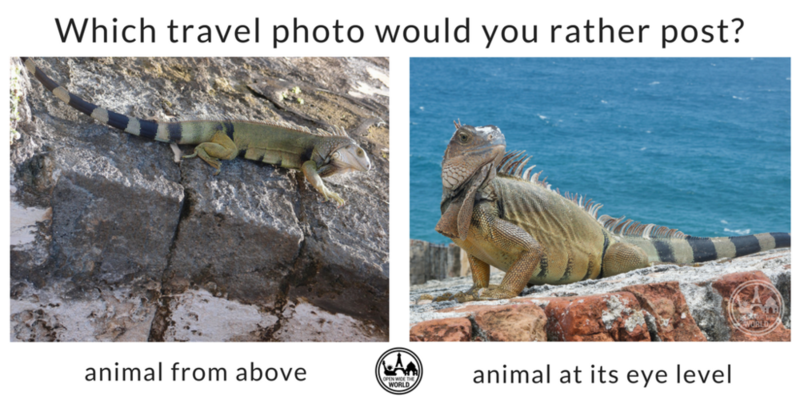 Iguanas are a big attraction on the ramparts of El Morro in San Juan, Puerto Rico. Photo on left attributed to Mike (flickr); photo on right is our own. This is my favorite tip, because it can be done in sweatpants on the couch, or even in jammies in bed. Scroll through Instagram and your favorite websites and notice which pictures jump out at you. Screenshoot the best images, then look over them later and see if you can pinpoint what you love about them. Funny subjects, unique angles, new-to-you filters, unusual layouts? Whatever drew you to your screenshots, take note. Then use that inspiration to up your own photography game. The screenshot gallery of my phone (seen below) has become a virtual "vision board" of travel photography, reminding me of perspectives to try out, elements to include more often, color palates to watch for in the world. Hubby and I scroll through our screenshots often (Homer is our site's main photographer), and discuss our developing photographic vision. And our work has evolved for the better (we like to think). My phone's screenshot gallery is a virtual vision board of travel photography. Our most recent nine smartphone screenshots inspire us to try new perspectives, color palates and elements in our photography. They are from the following IGers: pic 1 from @thewilliamanderson, 2 @jude_allen, 3 @kevinoutdoors, 4 @dctravelmom, 5 @amerikabstyleme, 6 @megancarswellgladden, 7 @sascha.vanderwerf, 8 @yashyanthi, and 9 @outdooradventurefamily. 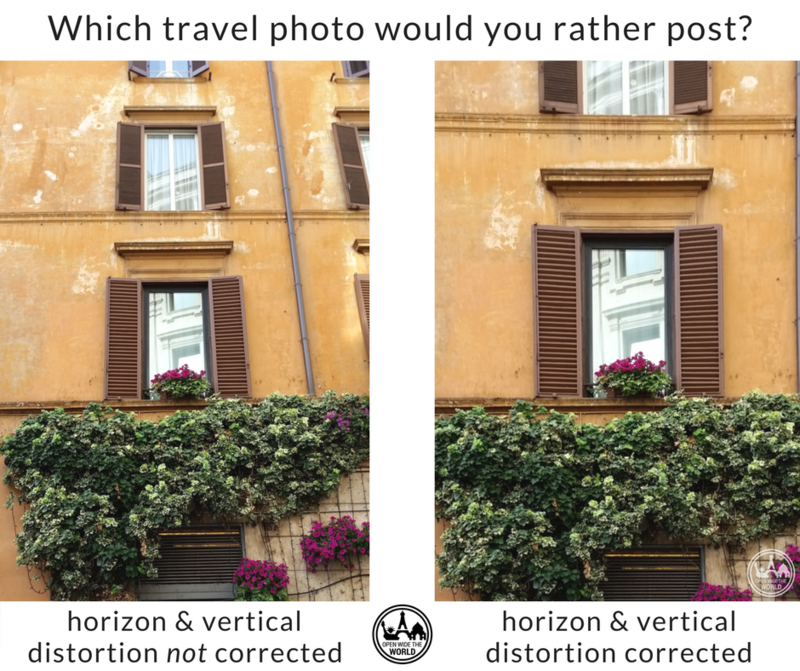 How have you improved your smartphone travel photography skills?